Merin is a teacher, a book blogger, a baseball addict (Go Cardinals! 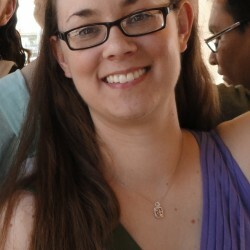 ), lover of music, movies and TV crime dramas, and YA/MG connoisseur. Follow me on my blog at http://ahandfulofconfetti.wordpress.com! 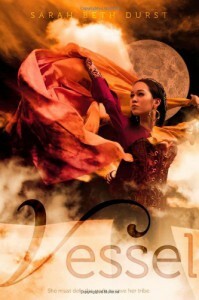 I was drawn to Vessel by the promise of a well-crafted world and unique mythology, and I'm happy to report that the book really delivered in those aspects. I also found within its pages an absolutely captivating and realistic main character, despite the fact that she resides in a purely fantastical world. Throw in a struggle for survival in a seemingly inhospitable land, and this was an interesting cross between something dystopian-like (it's not the end of the world, here, nor is this a post-apocalyptic tale) and high fantasy that had me immediately intrigued. While I do have to admit that the book took me far longer to read than it should have - like, five library renewals too long - I ultimately came away from this book extremely satisfied and glad that I stuck with it.Liyana is probably one of my favorite female protagonists ever, and I don't make that claim lightly. She is resourceful, stubborn, and so incredibly caring and loving that you pretty much start rooting for her right from the first page. When Bayla, her goddess, fails to come inhabit her body, she's thrust in a whirlwind of events that forever changes her, and ultimately she comes out all the stronger for it. Some people shrink away from danger and difficult times, but Liyana really embraced them and did all she could so that she and those she cared about would survive. I loved her quick wit, her intelligence, and - most of all - her ability to always have a story handy when it was most needed. As a librarian, I couldn't help but love that she's a storyteller!I also want to give mad props for the mythology used in this book. From the background on the gods, to their shared memories and stories, to their unique personalities, every single thing about them was so wonderfully and carefully crafted that it wasn't hard at all to imagine the world in which they exist. I loved how Korbyn - while still being a god - was very much humanized during his journey with Liyana, and I loved their shared interactions and the way their relationship developed. I'd wax on even more about this, but don't want to give too much away! Just, trust me, if mythology is your thing, you will LOVE this portion of the story!So, considering I've had nothing but praise for this book, you're probably wondering at my final rating. The truth is that I did have a bit of a slow time getting through the book, and even set it aside for nearly two weeks in order to read something else. While I ultimately enjoyed the story a lot, there were moments where I wasn't really compelled to pick it up, despite how much I enjoyed all the things I just mentioned above. This, for me, warrants a bit of a ratings drop, even if that slowness is my one and only fault with the story.Despite the time it took me to read this, Vessel is still a really wonderful book. Whether mythology is your thing, or you just enjoy reading about strong, stubborn, steadfast main characters, this book is sure to have something that almost everyone will enjoy. If you find it moving more slowly than you'd wish, my advice is to just stick with it; the last half really picks up and makes the whole thing extremely worthwhile. ***To see more of my reviews, please visit me @ Read and Reviewed!